Sisyphus was a legendary king of Ancient Greece, ranking alongside the lies of Ixion and Tantalus as Greek kings. Sisyphus though, would also have something else in common with Ixion and Tantalus, for Sisyphus would spend eternity being punished Tartarus. Sisyphus is named as the son of Aeolus and Enarete; Aeolus was the king of Thessaly and the king in Greek mythology who gave his name to the Aeolian people. Sisyphus would have many siblings, but amongst the most prominent was Salmoneus. Once of age, Sisyphus would leave Thessaly and build himself a new city, naming it Ephyra after the Oceanid of the water supply found there. Ephyra would become famous under a different name, for Ephyra was the original name for Corinth. Alternatively, Sisyphus became king of Ephyra after the city had already been established. In either case, Ephyra would flourish under the kingship of Sisyphus, for Sisyphus was extremely clever, and trade routes were established across Greece. Equally though, Sisyphus and a ruthless and cruel streak, for many guests in his palace died at his hand. 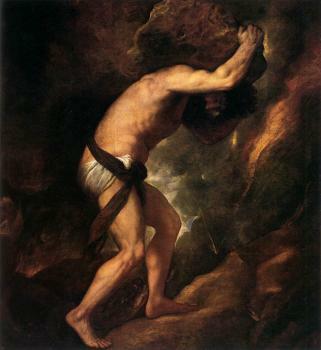 The cleverness and cruelness of Sisyphus was displayed in his dealing with Autolycus, the legendary thief. Autolycus was a neighbour of Sisyphus, and also a cattle rustler. Autolycus’ father, Hermes, had given his son the ability to change the colour of things, so he was able to change things from black to white, and other colours. Thus, Autolycus would steal away cattle from Sisyphus’ herd, but would then change their colours, making it impossible to identify with certainty Sisyphus’ cattle. Sisyphus was of course suspicious when the size of his own herd was diminishing, whilst Autolycus’ herd was growing in size. Sisyphus then used his cleverness, for into the hooves of his cattle he cut an identifying mark, and so they next time that cattle disappeared, Sisyphus with his army stormed onto the land of Autolycus. Despite the cattle having changed their colourings, by looking at the hooves, Sisyphus was able to identify his own cattle. In retribution for the theft, it was said that Sisyphus abducted and raped Anticlia, the daughter of Autolycus, although some say that Anticlia would become Sisyphus’ wife. Sisyphus was closely associated with three women, who were called at some time his wives. Anticlia was one such woman, but if she wed Sisyphus then her time in Corinth must have been brief, for she was soon in the company of Laertes, and later gave birth to Odysseus, but the timing of the birth of Odysseus gave rise to the suggestion that it was Sisyphus who was the father of Odysseus, not Laertes. The timing also makes it more likely that rather than marrying Anticlia, Sisyphus simply abducted her to have his way with her. Sisyphus was also said to have married Tyro the daughter of Salmoneus, and hence Sisyphus’ niece. This marriage though was said to have occurred because of the hatred that Sisyphus had for Salmoneus, and Sisyphus had been told a prophecy that if he had children by his niece then one of them would kill his brother. Tyro would indeed give birth to two sons for Sisyphus, but Tyro also found out about the prophecy and so killed the sons of Sisyphus before they could harm her father. The actions of Sisyphus and Tyro were both negated by the fact that Salmoneus was struck down by Zeus for his impiety. A third woman associated with Sisyphus was Merope the Pleiad daughter of the Titan Atlas. Sisyphus would become father to four children by Merope, Almus, Glaucus, Oryntion and Thersander. Glaucus would become famous as the father of the hero Bellerophon, although it was Oryntion who would succeed Sisyphus as King of Corinth. Legend has it that Merope would late feel shame for having married a mortal, or was ashamed for the crimes of her husband, hence why the star Merope, as part of the Pleiades, was the dimmest of the Seven Sisters. The crimes of Sisyphus would mount up, but it was his own sense of cleverness that first got him noticed by the gods, and Zeus in particular. Sisyphus was prone to use his intellect to keep track of the movement and the activities of the gods, and Sisyphus became aware that Zeus had abducted the naiad nymph Aegina and taken her to the island of Oenone. When Asopus, the Potamoi father of Aegina, came looking for his daughter, Sisyphus told him exactly what had occurred. Zeus of course would stand for any mortal interfering his affairs, and so Zeus made it known that the life of Sisyphus was now forfeit. Thanatos, the Greek god of Death, was dispatched by Zeus to take Sisyphus to the Underworld; now Sisyphus was predisposed to leave the mortal world, and so the King of Corinth would put his cleverness and cunningness into action. Thanatos had brought with him chains in which to bind Sisyphus, but before the Greek god could manacle Sisyphus, the king asked Thanatos just how they should be worn. Thanatos showed him by putting them on himself, and of course, now Thanatos was trapped in the chains that had been meant for Sisyphus, and Sisyphus had no intention of releasing the god. So, Sisyphus returned to his palace a free man. The chaining of Thanatos had its own implications though, for without the god, no one was dying. Some tell of how this greatly annoyed Ares, the Greek god of war, for if no-one died in battle then there was no point to fighting, and so these sources tell of Ares coming to Corinth to release Thanatos, and place Sisyphus once again make the king a prisoner of Thanatos. In Greek mythology though, Thanatos was strictly speaking the god of peaceful deaths, and so instead of Ares coming to Corinth, it was Hades who came, for Hades was worried about the lack of souls making it to the Underworld. Sisyphus though was intelligent enough to realise that the chaining of Thanatos would bring other gods to Corinth, and so he had planned a second way of cheating death. Sisyphus told his wife, which wife is not entirely clear, but presumably Merope, that when he died he was not be buried, and funeral rites were not be undertaken. Thanatos would take Sisyphus to the realm of Hades, passing over the Acheron without the need to pay the ferryman Charon, and in the palace of Hades, Sisyphus awaited judgement. Sisyphus though, did not wait for the Judges of the Dead to make their decision, for Sisyphus went straight to Persephone, and told the goddess that he must be allowed to return to Corinth so that he could scold his wife for the lack of a proper burial. Persephone would agree to allow Sisyphus to return to Corinth so that a proper funeral could be undertaken, but with body and soul reunited once again, Sisyphus had no intention of organising his own funeral, nor to return willingly to the Underworld. 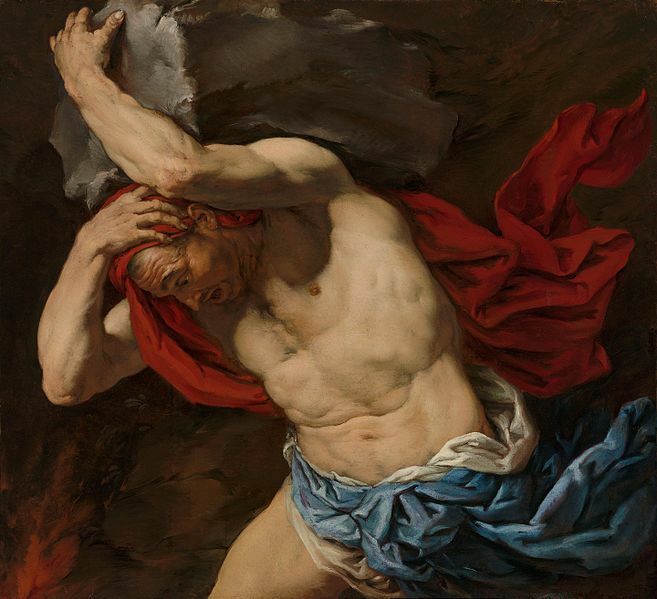 The actions of Sisyphus only served to make Zeus angrier than he had been initially, and so the supreme god sent his favoured son Hermes to ensure that Sisyphus once again returned to the Underworld, and to make sure that Sisyphus remained there. Hermes was a Psychopomp like Thanatos, and so Sisyphus was once again back in the Underworld, and Zeus had come up with an eternal punishment for the King of Corinth. The punishment of Sisyphus would see the former king rolling a large boulder up a steep hill every day. The goal being to reach the summit, for once reached Sisyphus’ punishment would end, but each day just as the peak of the hill was reached, the boulder would slip from the grasp of Sisyphus. The boulder would roll right to the base of the hill, ensuring that the Sisyphus would have to start his task again the next day.